Nowadays, innovativeness makes the business solution market flourish. New inventions emerge fast one by one. Investment in the best and the latest solutions is becoming more and more expensive, however. On the other hand, insisting on former and less effective solutions, while your competition invests in modern methods, bears some risks. Innovative companies can increase their competitive advantage easily which means they are capable of forecasting market trends and adopting to them much faster. 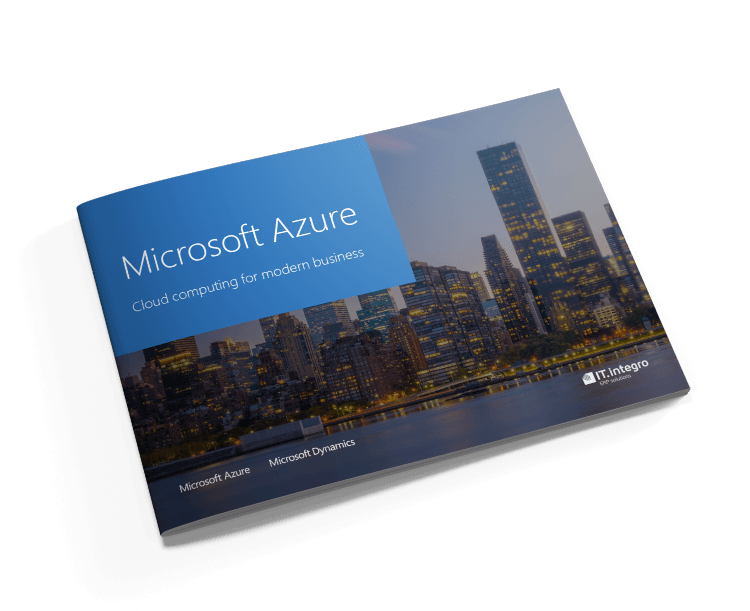 The Microsoft Azure cloud computing is a platform that enables you to keep your competitive edge without increasing your investment budget. With the Azure platform, all new products, solutions and services can be launched onto the market more quickly. You can scale your business as you want. Azure equips you with all you need to grow globally. And you can reduce your operating costs as you pay only for the actual usage. You can also decrease purchase and equipment maintenance costs and invest your savings into other business needs. Additionally, your data is protected by top level security software..
Microsoft Azure is a public cloud of unlimited capacity powered by Microsoft. It enables you to access your resources and additional services to maintain your own applications and increase your data center capabilities. 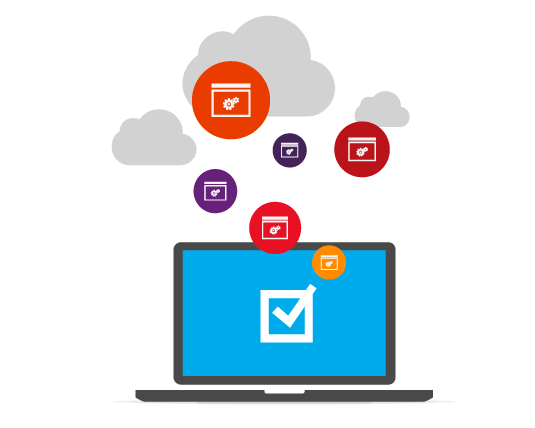 Microsoft Azure is your complete IT environment. Currently, cloud computing is the fastest growing IT service. The growing interest in this model of IT resources management results from the continuing demand for solutions which reduce operating costs and decrease computing capabilities. Microsoft Azure ensures unlimited scaling possibilities and efficiency for your business by providing you with unlimited data repositories. 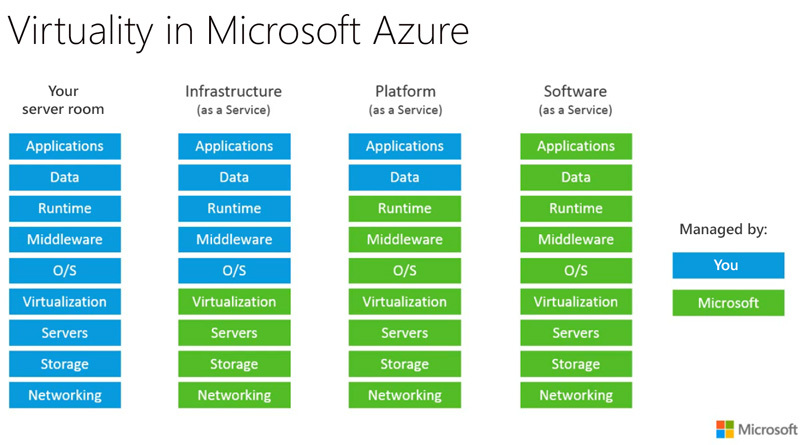 The Microsoft Azure cloud computing is available in two models – Platform as a Service (PaaS) and Infrastructure as a Service (IaaS). On Microsoft Azure, you can store your databases, applications and programs that you use every day at work. To use such solutions, you need servers the purchase and maintenance costs of which are overwhelming. You also have to take failures and stoppages into account. Cloud computing is fully scalable which means you can use only server space you actually need. With this solution you pay only for the resources that you have really used. Additionally, initial costs are low. The implementation is fast and does not require huge investment. The Azure platform can be used to host scalable websites. Micorosft Azure uses multiple data centers worldwide, thus ensuring reliable and secure environment and enabling you to implement apps for your customers. Cloud computing offers capabilities that cannot be achieved even on the most advanced desktops. Cloud-based solutions ensure improved user experience as well as personalisation possibilities without the risk of overloads. With cloud-based solutions, you do not have to worry about your server damage or delays due to natural disasters or unexpected overloads. They guarantee unsustained service, even in the most unexpected circumstances. 57% OF COMPANIES RANKED ON THE FORBES LIST USE AZURE. THIS IS THE PLATFORM WHICH POWERS SKYPE, OFFICE 365, BING, XBOX AND THE GREATEST BUSINESSES WORLDWIDE. Microsoft Azure is an ideal solution for mobile employees. Your sales representatives and sales staff have an ongoing access to your price lists or databases. You just need an Internet connection. Using Microsoft Azure, you do not have to worry about loss of your data. When stored in the cloud, your data will not disappear when your laptop has been stolen. And you can use this data from any mobile device. With Azure, data backup, retrieval and storage are much more economical and effective. For Microsoft data security is a priority, Therefore, the platform fulfils even the most restrictive legal requirements and security policies. Microsoft Azure is compliant with the EU Data Protection Directive (95/46/EC), Safe Harbor Framework and requirements for cloud processing of personal data of UE citizens, including Poland. 28 data protection inspectorates (including the Polish inspectorate) have validated Microsoft’s declaration for cloud-solution security, and data processing centers are periodically tested within Security Audits by independent agencies. Microsoft Azure ensures service availability at the level of 99,9% – 99,99%. The specific access values are set up individually for specific platform components. One of the most prominent Azure features is its scalability. The unlimited capacity of the cloud enables you to use it flexibly. Using the Azure platform, you not only need to worry about seasonal peaks and increased demand periods such as pre-Christmas period in retail business. You can enjoy permanent access and unlimited space, paying only for that you actually have used.